The chairlift to the summit Nos has been in operation since 1968. 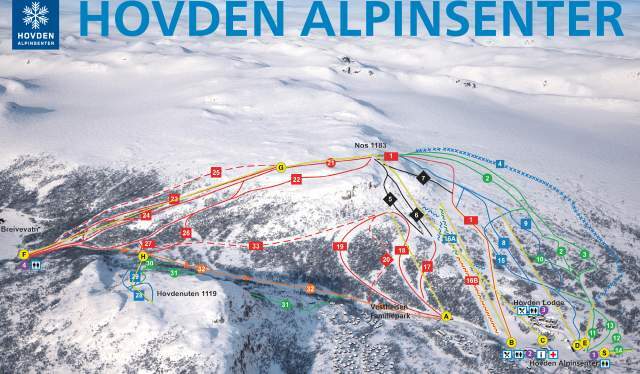 Today, the Hovden Alpine Centre is a modern and well-adapted facility for the whole family. The children's area "Tusseland" has become an eldorado for our youngest guests; and the terrain park is more spectacular than ever and is considered to be one of the best in Norway.. The 1250-metre terrain park at Hovden is considered one of the largest and best snowboard and freeski parks in Norway. It contains more than 30 creative and exciting elements. The smallest children have their own park in the “Tusseland” section. Powder on the slopes? Which cross-country trails are groomed? Find the answer here?